Slack is probably the most used team messaging app among startups and SMBs. We rely on Slack every day, so it made sense for us to provide a way to plug natively both of our platforms together. Why Connect Livestorm and Slack? 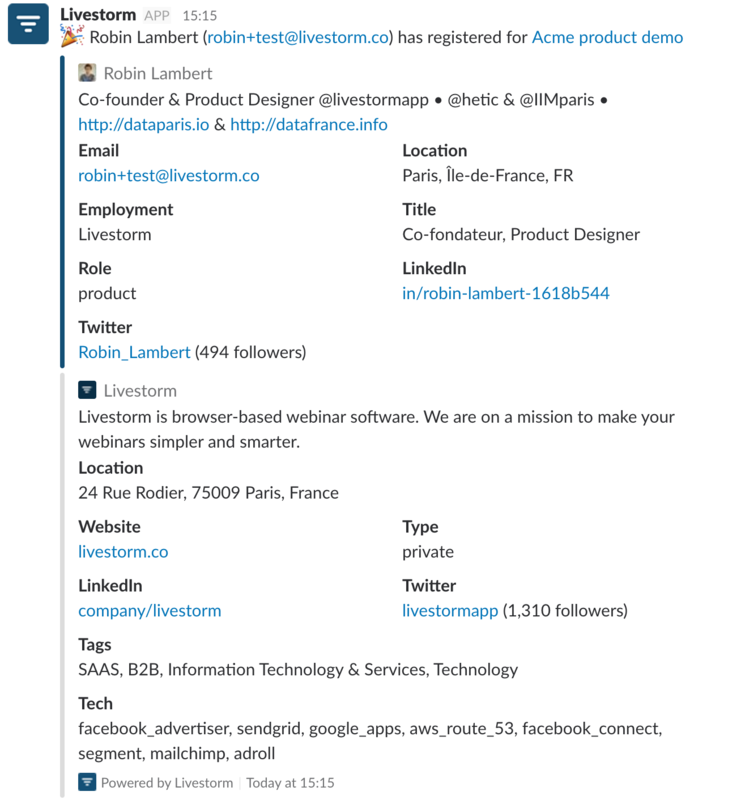 By connecting Livestorm and Slack together, you can send your registrants profiles directly to a Slack channel as soon as they register. This is useful if you need to reach out to VIPs before the webinar or just need to keep an eye on your registrations. Also, we enrich the profiles with third party data to provide more insights on your registrants. Each time someone will register to one of your webinars, we will capture the email, enrich the profile and send it to your Slack in the channel of your choice. To achieve that we rely on Slack incoming webhooks. 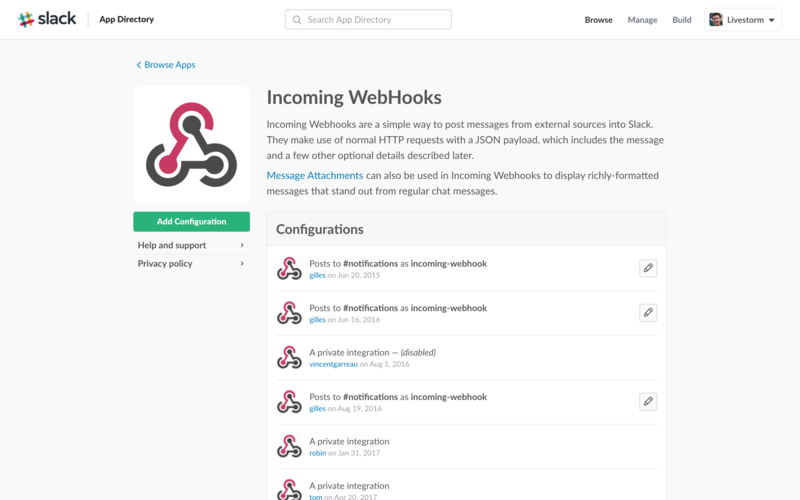 Follow each step until you land your webhook configuration. Then grab the URL. It should look something like: https://hooks.slack.com/services/xxxxxxxxx. 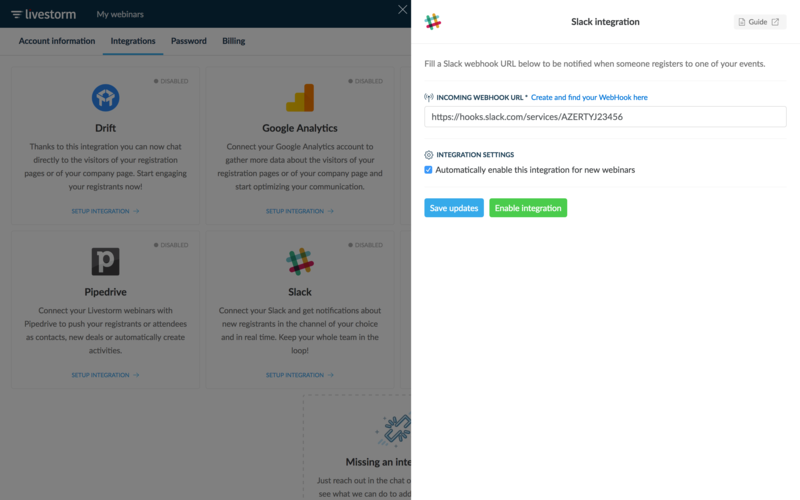 Note that you can make sure that this integration is enabled by default every time you create a new webinar. Just check that last box at the bottom. Import note: integrations you set up will be disabled by default for your previously created webinars. If you want to enable the integration for a previous webinar, just go to the webinar settings page and you'll be able to enable it under the Integration part.